Hershey's Chocolate World: A more richly themed alternative to Hersheypark? July 25, 2013, 8:42 PM · When people who know little or nothing about Hersheypark hear that there's a theme park with that name, I suspect that most of them envision something more like Hershey's Chocolate World than the actual amusement park next door. 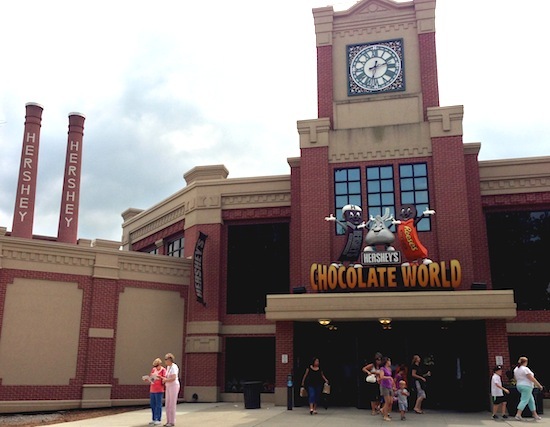 Opened in 1973, Hershey's Chocolate World replaced the factory tour at the old, now-closed Hershey's chocolate plant a few blocks away in downtown Hershey, Pennsylvania. The look of the attraction's exterior replicates the style of the old factory, including its iconic twin "Hershey" smokestacks. Substantially expanded and renovated over the years, Hershey's Chocolate World now includes an Omnimover-style dark ride, a 4D theater show, chocolate tasting, a "build your own chocolate bar" experience, and a trolley tour of the town — in addition to a food court and souvenir shop. 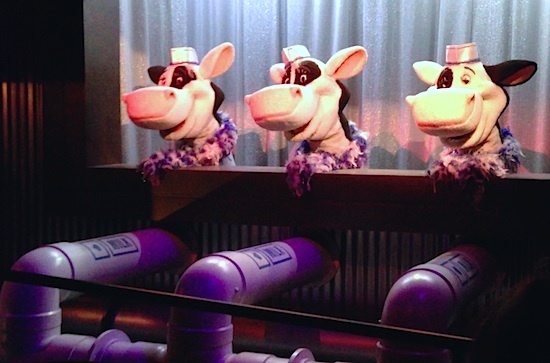 Three singing cows host your dark-ride trip through Hershey's world of chocolate. Imagine a completely corporate Epcot pavilion, one dedicated to telling the story of chocolate — as made by the Hershey Company, and you'd have Hershey's Chocolate World. Compare this attraction with Hersheypark next door, and it's like you're looking at two different companies' approaches to implementing the same theme. Hersheypark is, at its heart, a regional amusement park that simply references the Hershey brand without really exploring it or trying to deepen your relationship with it. When you're visiting Hersheypark, you're thinking more about airtime and visuals and speed and all the other things we think about when we're riding rides. If you're thinking about chocolate, it's simply about eating some more of it, as you might in any other iron park. An infrequent visitor would find it difficult to tell the difference between Hersheypark and similar parks such as Busch Gardens Williamsburg or Holiday World. That's not the case over in Chocolate World, which is unmistakably all about Hershey, chocolate and forever equating the two. Chocolate World doesn't simply name-check Hershey products, as Hersheypark does. Every moment inside Chocolate World is designed to deepen your connection with — and affinity for — Hershey's chocolate brands. It's the difference between how Six Flags treats Superman, for example, and how Universal treats Harry Potter or Disney treats any of its character franchises. At Six Flags, a Superman roller coaster doesn't do anything to deepen or inform your relationship with the DC Comics icon. It simply name-checks Superman, to exploit your already-existing affinity for that character in the hopes of transferring some of that affinity to the ride. But in the Wizarding World of Harry Potter, or Cars Land, or the Be Our Guest restaurant, Universal and Disney are going beyond simply name-checking something you already know and love. They're trying to lead you to into a deeper relationship with those franchises, rather than settling for you simply enjoying a few moments on a ride with their name. Disney and Universal want these rides, shows, and other experiences to boost your appreciation for their theme — not the other way around, as with Six Flags and Superman. To apply this analogy, Hersheypark takes the Six Flags approach, while Chocolate World goes the Disney/Universal route. The dark ride in the pavilion, Hershey's Great American Chocolate Ride, tells the story of the making of Hershey's chocolate products in a 10-minute musical narrative, designed by The Goddard Group, a major themed-entertainment design firm that also helped create The Amazing Adventures of Spider-Man, Jurassic Park: The Ride, and Terminator 2: 3D, among other attractions around the industry. The Jim Henson Company worked on Chocolate World's 4D show, Hershey's Great Chocolate Factory Mystery. 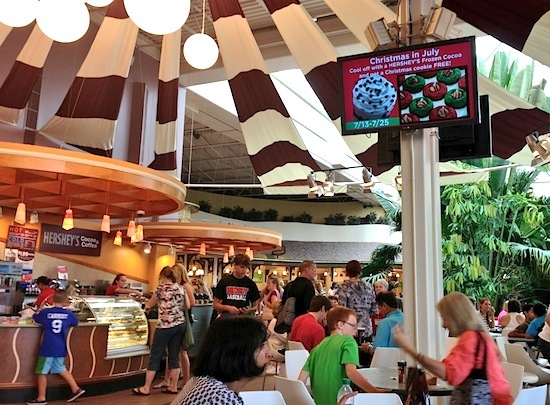 Sit in Chocolate World's food court, and you might as well be in a brighter, funner, sweeter version of the Sunshine Seasons food court in Epcot's The Land pavilion. But the disconnect between Hersheypark and Hershey's Chocolate World goes beyond implementations of theme. The dark ride in Chocolate World is free, but you have to pay to experience the 4D show, tasting adventure, build-your-own-bar experience, or trolley tour. Want to buy a combo ticket with the theme park? You can't. Hersheypark offers a combo ticket with Dutch Wonderland, an amusement park 30 miles away in Lancaster that Hershey Entertainment and Resorts Company used to own. But there's no combo ticket on Hersheypark's website that includes Chocolate World next door. You can buy a package that includes all four Chocolate World's paid-admission attractions for $39.95 per person. After spending about $50 a ticket for Hersheypark next door, we decided to ride the free dark ride, browse the shop, grab some chocolate drinks and dessert in the food court and call it a day. 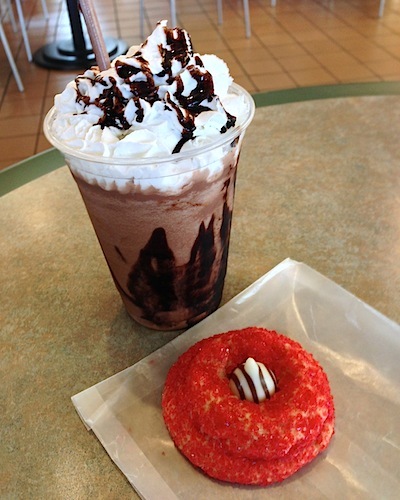 A Hershey's frozen cocoa, along with a free sugar cookie the attraction was offering as part of its 'Christmas in July' promotion. But what if we could have bought a combo ticket in advance, with an appropriate discount for buying the combo? We'd probably have spent the extra money and gone for the full Chocolate World experience. In lieu of that opportunity, after visiting both attractions, my wife and kids, who aren't that much of thrill ride fans anymore, said that they wished I'd just skipped Hersheypark and bought them Chocolate World tickets instead. I'd love to hear in the comments from fans who've bought the full Chocolate World experience if they think that was a good deal. Previously: Spending the day at Pennsylvania's Hersheypark, and Where to eat? Lunch at Hersheypark Place. July 25, 2013 at 9:03 PM · Hersheypark is a very nice park, one of better really, but when we visit it is all about The Great American Chocolate Ride. It is like a long lost spiritual cousin to an old EPCOT attraction that somehow lives on. The recent refurbishment added some sparkle and shine but the old-fashioned spirit lives on. We love it. July 25, 2013 at 11:01 PM · Just to respond to your opening comments about what people imagine Hersheypark to be like--growing up in the 1970s, I read in some magazine that the town of Hershey, PA had giant Hershey Kiss-shaped street lamps in the city, and a chocolate factory and an amusement park owned by the chocolate company. Back then I probably imagined something like Willy Wonka's chocolate factory, but from reading this website over the years, I think I expected a generic amusement park like a Six Flags. July 26, 2013 at 1:02 AM · Thank you for the learned discussion about the difference between an iron park and a theme park. These days, I'm only interested in the latter, and Chocolate World is much more appealing than Hershey Park. I remember going when I was a kid, and even then enjoyed the Chocolate World so much more than the iron park. July 26, 2013 at 2:30 AM · I went the day after Christmas in 1999 and it's more or less the same. The walk around characters are interesting, the dark ride amusing, and the store was expansive. It's no replacement for a thrill park but it makes a nice diversion and the new attractions seem to flesh out the experience a bit more. This has a museum, hands-on classes at the Chocolate Lab, and a cafe, where you can buy a sampler to taste chocolate from different countries. July 26, 2013 at 4:49 AM · They ruined the ride when they added the singing cows. I wish they would have just kept the old version of the Chocolate Tour ride; much less annoying and nostalgic. Now it's about as bad as it's a small world. July 26, 2013 at 7:30 AM · I don't know, I like the cows. It makes the attraction more accessible to kids, especially the ones that would rather just get off to grab that free piece of candy at the exit. I've run into the same connundrum as Robert. We'll spend much of the day in Hersheypark, and have already spent money on park admission and/or concert tickets. We'll visit Chocolate World on our way out, and it's just not worth it to spend more money for their add-on attractions. Not only that, but we're typically pretty tired after a day walking around Hersheypark (rather hilly on the east side of the park), so we don't feel like doing the other Chocolate World attractions, especially since they cost more money. We're pretty happy soaking in the air conditioned dark ride, grabbing a freebie on the way off the ride, and walking around the store before driving home (nearly 3 hours for us). July 26, 2013 at 9:05 AM · We've made an annual visit to Hersheypark ever since moving within driving distance. I love the park for it's rides. And, though it doesn't have the most thorough theming, something that was not mentioned in yesterday's or today's article was the street shows. These are great, themed shows mainly aimed at kids but are enjoyable for adults, too. We always make time to stop and see them. July 26, 2013 at 10:09 AM · What a shame you didn't want to do the entire Chocolate World experience, Robert! I grant you the 4D isn't really worth its price, but making your own chocolate bar was definitly a MUST-HAVE experience. Getting to know the entire line of production is really cool, and the bar I made was one of the best I've eaten in my life (the best chocolate I've eaten by Hershey, for sure!). Not because my creation skills are amazing; the chocolate itself and the ingredientes were the best they could offer, so the taste turned out to be unbelivable! The tour is amazing, since Hershey's history (the man and the town included) is so incredible to get to know! Also, the section were you create your own kisses packages is a great treat for the young ones. Something that is importante to mention: I attended the park 2 days after Sandy hit the East Coast, and must say that the staff was really accesible and didn't reflect the "local atmosphere" of an after-disaster week. Points for Hershey! July 26, 2013 at 10:14 AM · Ah, I forgot to mention: my family and I stayed at the Hotel Hershey, which was the perfect complement for our visit. Beautiful, not so expensive (considering the luxuries), with treats as "chocolate bars for every guest when you check in" and Kisses, Kisses and more Kisses on the restaurants, inside the room, etc, I definitely recommend it!! July 26, 2013 at 12:35 PM · I think a key difference is also how memorable the experience is. When you went over your Hersheypark trip report, I had quite a few, 'oh yeah, I remember that one' moments. But they were modest memories. I could, however, draw the floor plan of Hershey's Chocolate World and remember tons of details. And that's what builds a brand long-term (and I went home and bought the stock too). You did miss out on the Trolley and the Museum portions. The trolley guides are Tokyo Disneyland quality and the museum was pretty interesting. It can't keep up with the speed of the amusement park, but Chocolate World is a great time. 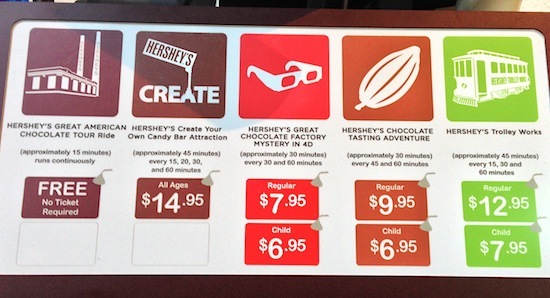 July 26, 2013 at 4:38 PM · It's a real shame that your wife and kids like Chocolate World better than Hersheypark. Don't get me wrong, no trip to Hersheypark is complete without a ride on the Chocolate Tour (not to mention buying a few fresh-baked chocolate and/or peanut butter chip cookies), but Hersheypark is one of my two favorite seasonal parks (along with BGW). It's so much nicer (and cleaner) than any of the Cedar Fair or Six Flags parks. I have gone to a bunch of parks by myself, but I'd never go to Hershey alone. It's got such a family atmosphere, that I'd miss having friends with me. July 26, 2013 at 8:57 PM · I've never done the full Chocolate World experience either, but I've done the free ride many many MANY times and the movie a few times. The movie, while cheesy, is good enough to be worth the $8 for someone like yourself. You probably should have done it.